We just got back from some fun times in Hollywood! One important part of the planning and packing was, of course, the travel knitting. The one yarn shop that it was possible for me to visit was no longer in business, so no souvenir yarn from this trip. I did have a shawl on circular needles for my airplane project, and had a sock project in the suitcase in the event that I had leisure time to work on it. That certainly didn’t happen. So, since there isn’t much knitting-related content here, let’s move right on to the trip! March 3, 2011 was the 100th anniversary of the birth of Harlean Carpenter, who would be known worldwide by her screen name Jean Harlow. She was my first cousin twice removed (my grandfather’s cousin), and over the last 10 years or so, we have met a number of wonderful people through that connection. One of those wonderful people is Darrell Rooney, co-author with Mark Vieira of the brand-new book, Harlow in Hollywood: the Blonde Bombshell in the Glamour Capital, 1928 – 1937. If you are at all interested in this period of Hollywood history, buy this book! It’s fascinating, readable, and filled with gorgeous photos. The book’s release was timed to coincide with the anniversary, a very special exhibition “Harlow at 100” at the Hollywood Museum, and a presentation by the authors and screening of her movie “Bombshell” at the historic Egyptian Theater. Jean Harlow is also the March 2011 Star of the Month on TCM. As family members, we were invited to attend the festivities, including a book signing at one of Harlow’s homes and a visit to another home she shared briefly with husband Paul Bern. One of the fascinating people we met at that book signing was Pauline Wagner, an actress who knew Jean Harlow. She’s 101 years old, but no one would have guessed! Other interesting and famous people that we met (and liked) included Holly Madison, Johnny Crawford who gifted us with a copy of his fabulous CD “Sweepin’ the Clouds Away” which features a picture of Harlow on the disc, and the gently humorous Rose Marie. See a slide show of pictures from our adventures at my other site, “Jean Harlow, otherwise known as Harlean Carpenter“. 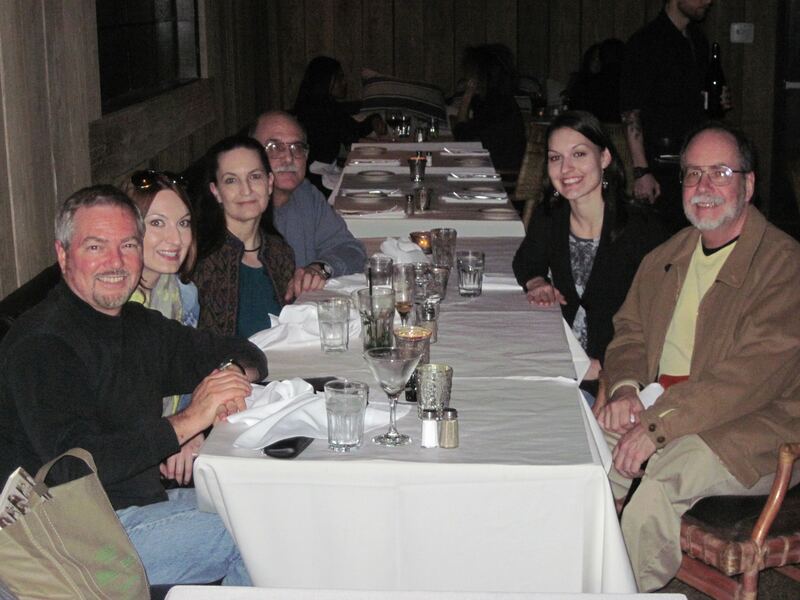 I’ll just share one picture here… if you look closely, you may recognize my Ithilien Brocade Jacket in this snapshot of my family with the authors at the beautiful Cliff’s Edge Restaurant. The Ithilien looks well on you! So, am I just inspired by the recent blog events/many pictures of Ms. Harlow – or is there a family resemblance? I hope you had a lovely time and gathered many special memories for yourself and your family.